We’re all familiar with zodiac and Meyers-Briggs personality types, but do you know your literary persona? You know, that’s the one that emerges when you’re in author mode. 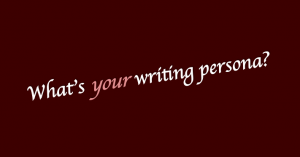 In the spirit of novelicious good fun, which fab female fits your writing persona? Mary Poppins: You’re a cheery but no nonsense sort with a whole bunch of tricks up your sleeve and a with a song in your heart. Although you believe in the power of magic, you know a strong work ethic will help see you through the chores of daily writing housekeeping concerns like editing and maintaining your blog. Practical and positive, you have friends from every strata of society. “A spoonful of honey makes the medicine go down” is your preferred method for dealing with tasks you don’t like much. Dorothy ( Wizard of Oz ): You often feel like an orphan because you have no writing family from which to draw strength or get advice but that doesn’t stop you from putting on your magical writing shoes and pursuing your dream. Lucky you, once you find some friends with brains, heart, and courage you all embark on the trip to publishing Oz together. With your friends’ help you’re able to escape the evil witch of plot holes, avoid the pitfalls of the rewriting forest, and fend off attacks of self-doubt flying overhead. But most of all, you know “there’s no place like home” when it comes to writing your novel. Anna Karenina: You’re gorgeous, intelligent, a great reader, and have the benefit of wealth and a good education. You follow your heart, even if that means doing things that are deemed inappropriate. Writing is your great passion, your reason for living, the reason your heart beats, and so you’re willing to make sacrifices and eschew conventions for the sake of your life’s passion. You must resist the urge to doubt yourself and fall into despair when experiencing disappointments and setbacks. You know that “respect was invented to cover the empty place where love should be,” and so you live the writing life with fierce passion. Which one fits your writing personality? Or is there another literary female you’re more like? This entry was posted in Reading & Writing and tagged writers life, writing blog, writing persona on May 8, 2016 by lzadmin. Thanks for including me in your Top Picks Thursday!! Fun post. I’d say Miss Marple fits me best. Love to research, analyze and solve puzzles.